A presupposition underlies this website and all its content: God is Truth. Since God is bigger than any one persons’s ability to comprehend, no one individual, nor even one group of persons, can ever claim to know all truth. As such our faith is a constantly developing and evolving awareness of who God is, who we are, and how we relate to God, to one another and to our world. Catholics believe that process is guided by the Holy Spirit and informed by Tradition. But it remains a process. 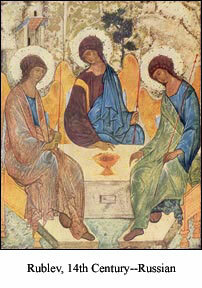 Each generation brings its own experiences of a living God to bear on that Tradition, as is reflected in the two icons of the Holy Trinity on this page. Those experiences are rooted in the belief that God continues to be concerned about and engaged in creation. And so each generation finds ever new and exciting ways of living its faith. In the pages that follow, visitors will have a chance to read reflections and articles from fellow believers. There is also a question and answer page to enable ongoing conversation and understanding.